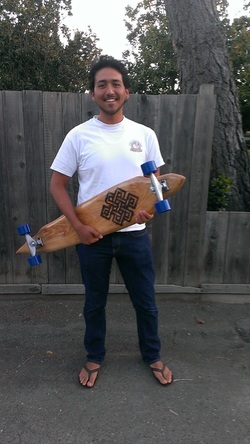 Back in January 2013, Knotty Boards had just started our journey. One of the first steps was getting our business license and opening a banking account. We did a lot of research on which bank to use, and for our small business we chose a smaller bank that offered world class customer service and products: Umpqua Bank. We had no idea how important a decision this would end up being. Soon after we signed up Umpqua Bank opened a new branch in San Jose, CA and contacted us to see if we were interested in taking part in their local spotlight. The local spotlight features a small business in the store location. In early March, when we set up our display at the Umpqua Bank store we also started a contest to win a Knotty Board - not just any Knotty Board, but the original Knotty Board. While the decision to do a giveaway around our flagship board was a difficult it seemed fitting.